Bridal mehndi designs which are absolutely fresh and unique! Bridal mehndi is an essential part of every Indian bride’s solha shringar. Her bridal look is deemed incomplete without the hands and feet painted with beautiful henna designs. While there are several bridal mehndi artists who create magic with their skills, it is important to know what kind of bridal mehndi design you would like to have for your big day. To give you some dulhan mehndi design inspiration, I have curated a list of the latest bridal mehndi designs that you can wear for your 2018-2019 Indian wedding! Check out these top 30 latest mehndi designs of 2018 for more inspiration. If you are not the one to experiment when it comes to bridal mehndi designs, then this traditional Indian bridal mehndi design is just for you! Full of peacocks, dhols, shehnai and paisley motifs, this leg mehendi design is for the bride who would love to have an intricate bridal henna design for her big day! 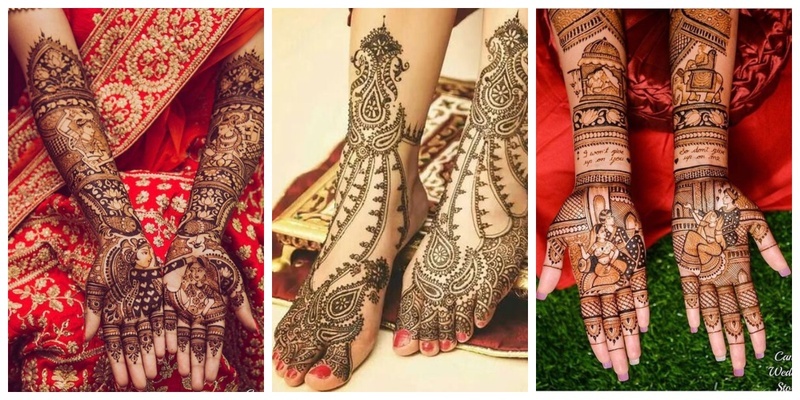 Here are a few more feet bridal mehndi designs which went really popular on instagram! For all you brides who want to have a hatke henna design on your wedding, this modern bridal mehndi design with super-cute couple figures is just perfect! One of this simplest wedding mehndi designs, this one has traditional floral motifs around a circle on the palm and roses, leaves and intricate pattern all over. Nothing beats a classic dulha dulhan figure mehndi design for a bride on her wedding day! It’s cute if you can personalise small details in the bride and groom figures to make it even more special. If you are a lover of royal paintings made in the olden days and want to incorporate them in your wedding henna, then this mehndi design image is all the inspiration you need. Also, did you notice the cute quote of ‘Don’t give up on me’? If you wish to include god and goddess motifs in your bridal mehndi, then you can definitely take an idea from the beautiful mehndi design featuring Lord Krishna and Radha’s portrait. Bridal Arabic mehndi designs are a great pick for brides who love floral and airy motifs that are not intricate but look beautiful when put together. If intricate feet mehndi designs with Indian motifs is your style, then this Peacock feather and lotus pattern bridal mehndi design is something you can consider to wear for your big day! One of the cutest and latest mehndi designs for wedding, this one is sure to fancy the Disney princess fan in you! Totally loving how this bride has chosen to write both her and her hubby’s name in the mehndi design. If you too are a fan of personalised mehndi art, where you wish to tell a story, then a modern bridal mehndi like this is a great source of inspiration. You can choose a special moment in your courtship or something else of your liking and make your bridal mehndi even more special. Here are a few personalised bridal mehndi designs where the bride chose to share her love story via her henna design! Simple motifs and an easy and clean pattern make for a simple yet beautiful looking feet mehndi design. If you want to have mehndi up to your knees but don’t want it to be too intricate, then minimal and spacious motifs like this mehndi design image is something you can definitely choose. This back hand henna design with intricate Indian motifs is a classic pattern that you can choose if you are planning to opt for a traditional mehndi design for your big day. You can have your proposal ingrained on your bridal mehndi by choosing to add cute figures like this on the palm and surrounding it by floral or Indian motifs as per your choice! Adding wedding ceremonies like varmala or sindoor ceremony in your bridal mehendi has been catching up with brides off lately. These kinds of bridal mehndi designs not only make the mehndi look cute, but also bring together all the other motifs in the design. If you are the bride who would rather wear mehndi only for shagun then a minimal bridal mehndi design with floral and Indian motifs like this one is perfect for you! Beautiful vines of flowers and leaf motifs are woven across this hand mehndi design! Such a stunner for a wedding! Paisley, hearts and flowers are some mehndi motifs that are never going out of style for bridal henna designs, and for all the right reasons. Don’t you just love this full hand bridal mehndi? One of the best intricate bridal mehndi designs of 2018, this one has elaborate net motifs and delicate floral pattern, which makes it look stunningly eye-catching! A simple mehndi design that’s not too fussy is perfect for the bride who wants to add some jazz to her wedding henna design, but doesn’t want to go all crazy! So did any of these bridal mehndi designs inspire you enough to wear it for your 2018-2019 wedding?